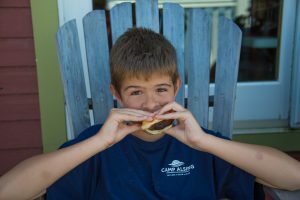 At Camp Alsing we empower our campers in a fun, supportive environment that fosters personal and social growth through a variety of activities and guidance from specially-trained staff. 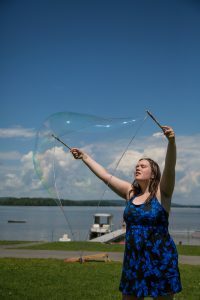 We provide campers with the tools to confidently solve problems more independently, and experience new places and people less encumbered by the social anxiety that clouds thinking and inhibits new experiences. We recognize that social cognition develops through repeated experiences, guided by a role model who helps develop and reinforce core strategies that can be used across settings and for a lifetime. We are able to take the time to work with campers so they understand and practice cognitive strategies, thereby gaining confidence and friends in the process. Our social learning program is influenced by the Social Thinking® approach of Michelle Garcia Winner, MA CCC-SLP, and the 360 Thinking Model of Executive Function Skills of Sarah Ward, MS CCC-SLP. Strengthening our flexible thinking muscles. Through their time at camp, our campers build a toolbox of skills and coping strategies they use in real time to improve their social executive functioning, increase resilience and decrease the anxiety associated with novel experiences. These concepts are modified according to each camper’s current skill level to allow for functional carryover during the day with the support of our trained camp coaches. Our focus is catching those teachable moments throughout the day to improve self-confidence and social awareness to make connections with other campers. Each activity at camp is intentionally designed to offer opportunities for connections with others and to safely extend campers’ comfort zones – what is commonly referred to as ‘challenge by choice’. 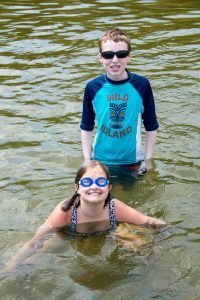 For example, when campers experience the thrill of swimming in a Maine lake for the first time, some may be hesitant about the unknown. With the help of their counselor, success can be recognized as the steps they take in trying something new, and not necessarily getting it right on the first try. Later, during a quiet period, there is the chance to reflect with the staff and put the day’s events in perspective. This is a fun and effective activity allowing the campers to ‘re-experience’ and solidify that emotional connection they felt with each other. In this way, campers have tremendous fun, try new things and enjoy positive peer relationships, all within a supportive framework that fosters their growth. One of the goals of Camp Alsing’s program is giving your child new skills that they can use away from camp, and to return home filled with memories and friendships that they find nowhere else. Because of the time we take to know each camper, we are better able to guide and teach them according to who they are. Camp Alsing is a treasured community that campers return to each year and provides a source of confidence, strength and skills. During camp you will receive weekly email updates providing information on your child’s accomplishments, challenges and growth. After camp, you will receive a report describing your child’s camp experience, highlighting useful social strategies and offering suggestions for continued skill development at home. Finally, a follow-up phone call is held with our clinical directors to discuss specific concepts that were most useful for your child, and to outline areas of growth for the coming year.